Some spacecraft instruments and detectors such as infrared systems and their focal planes require cooling down to cryogenic temperatures. There are three technologies that have traditionally been used to cool those focal plane arrays and instruments down to their optimum operating temperatures. Those technologies are stored cryogen cooling systems, cryogenic radiators, and cryocoolers. 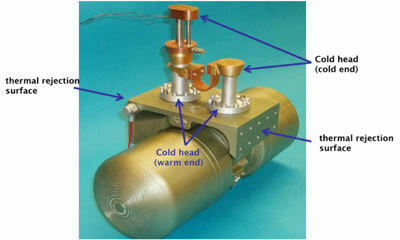 Stored cryogen cooling systems require the placement of a dewar on board the spacecraft. This dewar effectively maintains the cryogenic fluid until it is required for use. Cryogenic radiators are potentially effective down to about 75ºK. Cryocoolers are mechanical devices that require power to operate and to continue to operate. Cryocoolers can reach temperatures as low as 4ºK. Dependent upon the mission, each of these technologies would be under consideration. This project focuses on cryocoolers and the improvement of those coolers to make them more efficient and lighter weight. Cryocoolers are electromechanical devices based on sterling, Gifford-McMahon pulse tube or Joule-Thomson effect. For the purposes of this case study, consider a cryocooler an exotic space borne refrigerator. 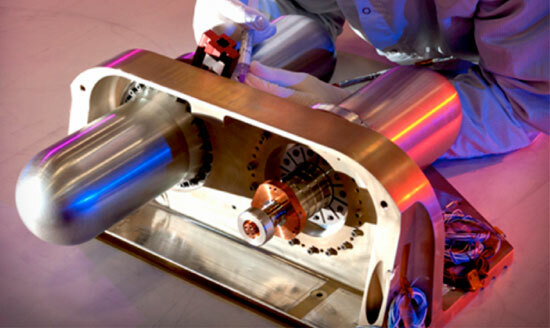 Its purpose is to cool one singular device down to very low cryogenic temperature in the range of 4-20ºK degrees. Significant input power is required to effectively provide a small amount of cooling to these cryogenic temperatures. Anything that can improve the operating efficiency of these devices can have substantial benefits in reducing system power requirements and weight. Peregrine has embedded Thermal Pyrolytic Graphite (TPG) by means of Liquid Interface Diffusion (LID) bonding into aluminum to yield over a 3.5 times increase in thermal conductivity over typical 6061T6 aluminum. It was determined that this would lead to an over 80-Watt reduction in input power for cryocooler designs providing a significant performance gain. This innovation will reduce the mass of cryocoolers, reduce the required input power and increase a cooler system’s margin for a given cooling load. The Peregrine Falcon Corporation, significantly improved the overall performance of pulse tube cryocoolers for Long Wavelength InfraRed (LWIR) and Very Long Wavelength InfraRed (VLWIR) sensors (operating from 40ºK down to <10? K) by enhancing the thermal conductivity of structures internal to the cryocooler. This enabled more efficient heat removal. Peregrine’s proprietary process for incorporating Thermal Pyrolytic Graphite (TPG) was used to increase the heat flow in critical areas, and thereby improve the cryocooler performance, without increasing the overall mass. The advantages of LWIR and VLWIR sensors in missile defense include passive Above The Horizon (ATH) detection and tracking of Re-entry Vehicles (RVs) and decoys at lower temperature and at greater range. During midcourse missile flight, passive IR tracking and discrimination of ballistic missiles, re-entry vehicles, and deployed decoys are difficult without the use of sensitive LWIR and VLWIR focal planes. By collecting photons at longer wavelengths, emitted by cold bodies, a vast improvement in identification, discrimination and targeting capability can be realized. The use of multiple spectral bands can also be utilized to enhance sensor platform ability to measure cold body temperature and cool-down rates, which can further enhance the ability to separate lethal objects from decoys. Figure 2: Model of a three-stage cold head showing the location of the pulse tube cold head warm end relative to the thermal rejection surfaces. Consider two cryocooler designs, both with a thermal rejection temperature for the cooler of 300ºK, one with a 10ºK temperature rise above that at the base of the cold head and the other with a 33ºK temperature rise. These correspond to cooler designs with and without the use of TPG in the center plate. The cold head rejecting to 333ºK requires 17.7 % more input power for the same cooling load than the cold head rejecting at 310ºK does, corresponding to a difference of 88.4 Watts in a 500 Watt cooler. To reduce the temperature rise between the pulse tube cold head and the thermal rejection surface, we incorporated TPG into the interior of the cryocooler “center plate.” This resulted in increased thermal conductivity producing a lower temperature drop and lower cryocooler mass. Its net effect was to reduce the mass of the cryocooler at the same time it reduces the required input power for a given cooling load. We embedded TPG in the thermal path between the warm end of the cold head and the thermal rejection surfaces within a matrix of aluminum to create a very high thermal conductivity “Center Plate”. The TPG and aluminum were joined based upon a Peregrine proprietary Liquid Interface Diffusion bonding process (LID bonding). TPG and aluminum do not readily metallurgically bond to each other and therefore Peregrine utilized a vapor deposited intermediate layer. 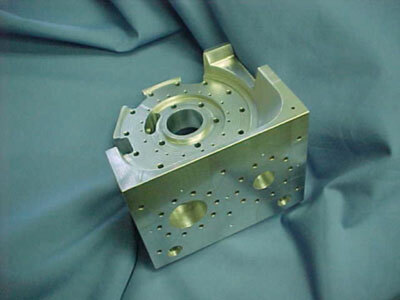 Previous industry attempts to embed TPG within aluminum were based upon a mechanical bond that is in essence a shrink fit of the aluminum around the TPG. This does not create a metallurgical joint and can lead to separations as the TPG and aluminum slide over each other during temperature excursions thus compromising the TPG’s high thermal conductivity. Peregrine utilized a thin vapor deposition of an intermediate material that was compatible to both and created a metallurgical bond under pressure and temperature. Figure 3: Center Plate, TPG embedded in aluminum. Peregrine successfully embedded TPG within aluminum (as seen in Figure 3) to create a passive high thermal conductivity solution reducing a temperature gradient by 34°C. Also by using TPG within this system, we had a weight savings of at least 17kg (37.4lb). We designed, analyzed, fabricated, examined and tested the center plate for performance against the requirements and were able to exceed all.